Washington Post "10 Best Graphic Novels of the Year"
New York Magazine "The Year’s Most Giftable Coffee Table Books"
The Verge "The Ten Best Comics of the Year"
From the #1 NYT bestselling author of Can’t We Talk About Something More Pleasant?, Roz Chast, an "absolutely laugh-out-loud hysterical" (AP) illustrated ode/guide/thank-you to Manhattan. New Yorker cartoonist and NYT bestselling author Roz Chast, native Brooklynite-turned-suburban commuter deemed the quintessential New Yorker, has always been intensely alive to the glorious spectacle that is Manhattan--the daily clash of sidewalk racers and dawdlers; the fascinating range of dress codes; and the priceless, nutty outbursts of souls from all walks of life. For Chast, adjusting to life outside the city was surreal--(you can own trees!? you have to drive!?) --but she recognized that the reverse was true for her kids. On trips into town, they would marvel at the strange visual world of Manhattan--its blackened sidewalk gum-wads, "those West Side Story-things" (fire escapes)--and its crazily honeycombed systems and grids. 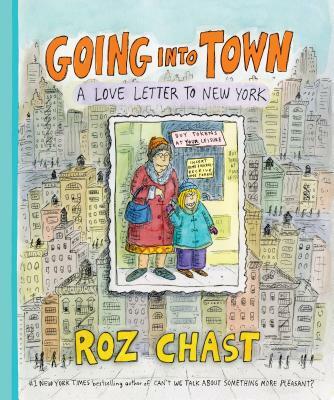 Told through Chast’s singularly zany, laugh-out-loud, touching, and true cartoons, Going Into Town is part New York stories (the "overheard and overseen" of the island borough), part personal and practical guide to walking, talking, renting, and venting--an irresistible, one-of-a-kind love letter to the city. "The New Yorker magazine cartoonist has a style and sensibility like no one else's. Here she employs it in a graphic memoir of and tribute to New York City. Though she now lives in the Connecticut suburbs, Chast grew up in Brooklyn . . . As her own daughter prepared to move to the city for college, Chast compiled this volume that lets readers see New York through the artist's eyes." - Newsday, "Best Fall Books"
"For New Yorkers past and present, as well as those who admire the city from afar, this book is sure to delight." - Bookish, "The Must-Read Books of Fall 2017"
"Love New York? So does Roz Chast, and we’re the luckier for it . . . A handy reminder of what makes the city lovable, maddening and a little gross." - The Forward's "These Are the 23 Books You Need to Read this Summer"
"The great New Yorker cartoonist salutes Manhattan." - Milwaukee Journal Sentinel, "75 books for holiday gift giving"
"Whatever your experience of New York City, Chast will add to it in her inimitable laugh-out-loud way. There may be a better, funnier cartoonist working in the world today, but none that I know of." - Daily Herald, "Book Buzz: What to Read"